Description: Lapel pin with Heart and Precious Feet in the middle. Beautifully finished gold-electroplated lapel pin. 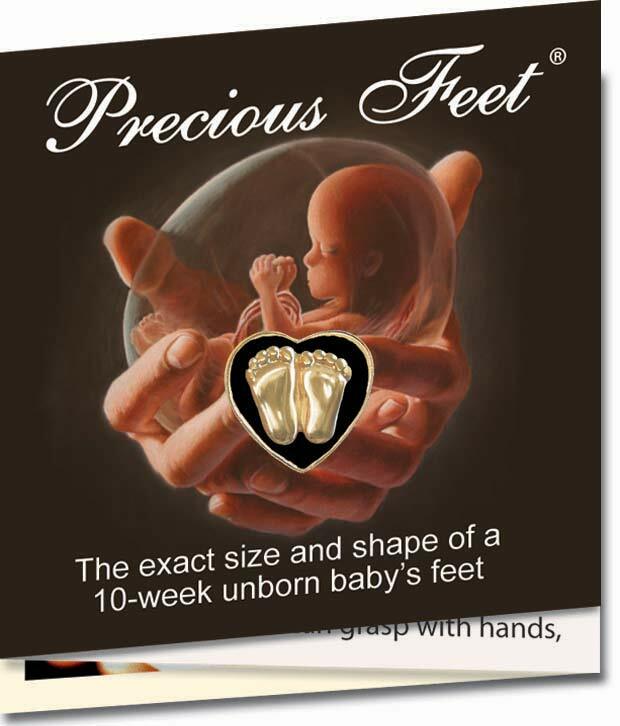 The International Pro-Life Symbol "Precious Feet". The Precious Feet are the exact size and shape of an unborn baby's feet at 10 weeks after conception. Since the infamous Roe vs Wade decision of 1973, the Precious Feet have been quietly doing their work changing hearts and saving lives. Size is 1/2" x 1/2". I came across the Previous Feet lapel pin and fell in love with it. I am passionate about supporting pro life. I wear this pin almost every day and it has survived many trips through the wash when I forget to remove it! I wear these pins to give me an opportunity to explain how God placed a special burden on my heart for the little ones who cannot speak for themselves. I then ask members of my audience to ask God to place His special mission for them on their heart.